I love this movie. Oh boy, do I love this movie. Of all 10 films on my top ten list this year, this is the only one I haven’t had second thoughts about putting in the spot I did. I put it on the number one spot, as the best film of 2007, and I stick by that, especially after revisiting this magical film on DVD. Let me tell you right now though; it’s not everyone’s cup of tea. It’s has a totally different flavor than most films, and to some will seem like a silly, pointless comedy. Personally, I think it’s so, so, SO much more than that. The movie begins with Peter Whitman (Adrien Brody) jumping onto the train he almost missed, “The Darjeeling Limited.” He joins his brothers Francis (Owen Wilson), and Jack (Jason Shwartzman), already on the train. At the insistence of Francis, the brothers are going on a spiritual journey through India, to bond as brothers after the death of their father. That’s all you need to know about the plot. In fact, to say this film has a strong, complex plot would be a total lie. The plot isn’t important. This whole film is about characters. Three very human, very real, and very sympathetic characters, and how they grow as people on their spiritual journey. If you had to leave the theater (or walk out of the living room) while the movie was playing, and came back asking your companion what happened while you were gone, the answer would probably be ‘nothing.’ Because in truth, the plot doesn’t take a lot of twists and turns, but each scene is important for character. And that, truly, is what makes this such a brilliant and deep film. Wes Anderson’s smart script (which he co-wrote with Roman Coppola and Jason Shwartzman) is excellent. The dialogue is just a joy to listen to. Each line has multiple subtexts, whether it be humor, philosophy, or simply bringing out the multiple sides of the character. Taken as a comedy, this is my favorite kind of comedy; it never goes for the obvious gag. The humor is extremely subtle, never shoved down your throat in any way. Taken as a drama, this is my favorite kind of drama; there’s plenty of emotion, but it isn’t spoon-fed to you. The viewer has to pick it apart. But the script would be nothing without the phenomenal performances. Owen Wilson might be my favorite comedic actor at this point. He’s brilliant, and this is one of his all-time best performances. Adrien Brody is equally good, but in a different way. He’s more reserved, but a very, very deep character nonetheless. I’ve never cared for Jason Shwartzman as an actor, but he really does a great job here, delivering very dry humor and making it hilarious. Wes Anderson’s camera work is extremely creative and inspired; he rarely uses multiple shots, but swings the camera around to show us the different characters. It adds a depth to the film that I really enjoy. Anderson also makes full use of the 2.35:1 widescreen image; something is always happening across the large width. The music is compiled exclusively from other films, mostly Indian cinema. It’s all placed in the film with perfection. The Indian music sounds like its coming out a tinny little radio, adding a feeling of being in the room with the characters. Songs by the Kinks and the Rolling Stones also help the drama. Put all these elements together, and you’ve got as close to a perfect movie as one could ever hope to find. This is a character study, plain and simple. We come to love these three brothers, and hope all goes well on their spiritual quest. I think it can speak to everyone on multiple levels. It certainly speaks to me, but I couldn’t explain how. It’s so multi-layered, everyone can interpret certain pieces in a different way. That’s why I love this movie. That’s why I named it the best film of the year, and I’ll stick by that. Not everyone will understand it, but this is simply a brilliant movie. It’s quirky, strange, hilarious, heart-breaking, awkward, and most importantly, heart-warming; everything a film should be. The movie is only 90 minutes, but it feels so much longer. Not because it’s slow or badly paced. It feels long because we get inside the heads of these characters, and feel the same journey that they go through. It’s a long, emotional journey. As an audience member, I felt like I was whisked away to India on my own spiritual journey, and came back home all in 90 minutes. I love this movie. To me, it’s absolutely the best of 2007. Hotel Chevalier was made a year or so before Darjeeling. The full film is actually a sequel to this 12 minute short, which features Jason Schwartzman staying in a Hotel by the name of (you guessed it) Chevalier. He’s visited by his old girlfriend (who is reference many times in Darjeeling) and the two spend some time together. This is a very well made short. Natalie Portman portrays the girlfriend, and proves once again that her terrible performance in the Star Wars prequel’s was probably George Lucas’ fault. Not anything of real importance happens in this short; like the real film, it’s all about character development. We get to know these characters and their past surprisingly well in just 12 minutes. Anderson uses many of the same camera features he would later use for Darjeeling Limited. Like in that film, this short uses it’s 2.35:1 image to great effect. On its own, this is simply a good little short that doesn’t entirely make sense, but is surprisingly deep. However, taken with The Darjeeling Limited, it adds a huge depth to both films. Darjeeling makes many references to this short, and visa versa. Viewed with the short (which is what Anderson intended) the viewing experience grows exponentially. The 2.35:1 anamorphic widescreen video is fairly good if not great, and is equal in quality on both films. The video isn’t all bad; in fact, it’s quite good, but there are some detracting qualities. On a positive note, the colors are always vibrant, and for the most part, detail is sharp and crisp. Outdoor scenes or brightly lit scenes exhibit this the best. The beautiful Indian landscape looks great, and you can see every grain of dirt on the ground. Sometimes, facial features are too soft, and lack detail (especially visible in hair). Contrast is overall solid, but some dark scenes should feature deeper blacks. Overall, this is a solid image. Pretty good, but not a home run. The audio doesn’t fare as well, but that’s more an inherent problem with some source material. Much of the music sounds tinny and old, but it’s supposed to. That’s what Anderson was going for. Sometimes, though, the music overpowers the dialogue, making it hard to hear what the characters are saying. I’d like the audio to have a bit more bite to it; a bit more clarity. Even though some music is supposed to sound old, it should sound old with a bit more...clarity, if you know what I mean. The songs that are supposed to sound new and well-mastered, like the Kinks songs, don’t come through as well as they should. But this is a small quibble. The audio matches the video fairly nicely, and combined, the viewing experience is more than adequate. The cool DVD menu gives you three options. View the film with Hotel Chevalier, view the short on its own, or simply watch The Darjeeling Limited. The disc treats the two films as films; it doesn’t relegate Chevalier to a bonus feature (which it isn’t). I’d recommend using the first option. Watch both; it’s a better experience. Before I go on to Extras, let me stress that Hotel Chevalier is not a bonus feature. It is part of the film, and if Fox had released this movie without the short, it would be like releasing a DVD of The Godfather with the first fifteen minute spliced out. The disc itself doesn’t treat the short as a bonus, which is good; it doesn’t factor into my rating on the extras. The real extras are fairly bland. We get two of ‘em. 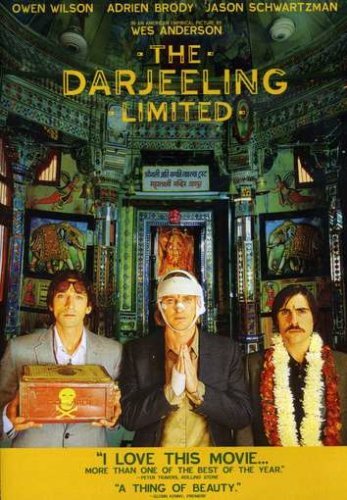 First is a 21 minute featurette entitled The Darjeeling Limited: Walking Tour. It’s just on-set footage, and is somewhat interesting to watch. Sadly, though, it isn’t really organized in any logical way; it seems like a random collection of footage. We get some good stuff with the production designer discussing how they hand painted the train, and how most of the furniture on it was hand-made. But there’s no interviews with any of the cast or crew besides the production designer. This is worth a watch, but it’s not great by any means. I’d give the featurette a B. Of course, one B-level bonus doesn’t make for a great extras section. We also get the theatrical trailer, in anamorphic widescreen. I have to tell you, I forgot for a moment what theatrical trailers on DVD’s looked like. The last DVD I purchased that included the trailer was Spider-Man 3 back in October. Hollywood has all but stopped putting trailers on discs. I wish they would do this more, and I’m glad to see the trailer here. But a trailer and an average featurette make for a very dull extras section. Where’s some stuff about the origin of the project? The casting? The filming? Picking locations? I want answers! A commentary would have been great. Can’t you imagine how fun a commentary with Anderson and the three cast members would have been? Oh well. I’m ecstatic to just have the film itself on DVD. Rumor is a Criterion Collection release of the film is coming this fall. Criterion has done a DVD for all of Anderson’s films, so I think we can expect one soon, and it will be loaded with extras. This isn’t a home-run disc, but it gets my absolute highest recommendation for the film it contains. In exchange for me writing this review, please do me a favor. Go rent this movie, or order it from OnDemand. Watch it. Try it. If you don’t like it, turn it off, but at least give this film a chance, because in my humble opinion, films this good are so hard to come by.